The 3D Carousel is the first building in a series of 3D ornaments that make up a fun fair at the ThreadABead Fairground. This ride is a very special one as it rotates 360 degrees, just like a real carousel! The 3D Carousel has been designed sit on a mantle piece as part of a fairground scene, however we have also included instructions to create a loop and tassel to make the carousel into an exquiste hanging ornament too! Made using Round Peyote the carousel takes around 6-7 hours to bead. As usual with ThreadABead featured patterns we give full detailed photographic instructions and in this pattern there are 77 detailed steps, making this pattern even suitable for beginners to beading. Please note the pattern may not work with any other size and type of beads. 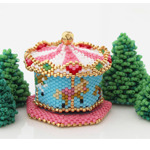 There are 14 colours in total and the finished beadwork is approximately 3.75cm (w) x 3.75 (d) x 3.75 (h) cm. The height with loop and tassel is 20cm. Wadding is required along with 2 x head pins (eye pins if you want to add the tassel and loop), 1 x 10mm crystal, 11 x 8mm crystal ab, 9 x 6mm crystal ab, 1 x 3mm crystal ab, 18 x 3mm gold plated, 1 x 6mm gold plated bead, 2 x gold plated jump rings and a small thin piece of clear plastic such as acetate, which can be found on used food packaging etc. A no tangle thread bobbin is useful. Additional tools used in assembly are round nosed pliers, cutters and flat nosed pliers. The bead pattern supplied is 26 pages and includes a full colour photo instructions and coloured pattern chart where needed.